ALLi blog editor Debbie Young tests the online service Grammarly as a potential proofreading tool for indie authors. As an avid reader of self-published books, I know how galling it is to have the flow of a good story interrupted by typos and grammatical errors. Yet as an indie author, I understand the temptation to bypass professional proofreading if you’re trying to self-publish a book on a tight budget. I was therefore interested to learn about the online service Grammarly, a souped-up spellchecker with lots of extra bells and whistles. Could it be just what indie authors need to debug their manuscripts at little or no cost? Encouraged by bold claims in Grammarly’s marketing material (“the world’s most accurate grammar checker”), the company’s 739K likes on Facebook and my unfailing spirit of optimism, I approached my test drive with high hopes. 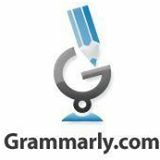 Grammarly is an automated online system that instantly checks submitted text for accuracy. It considers grammar, punctuation, spelling, typos and style, and also offers an online thesaurus. Grammarly also checks your copy on the internet for plagiarism. I cut and pasted a passage from my YoungByName blog and was gratified to be shown a link almost immediately to the original source. Less impressively, Grammarly didn’t recognise the quotes I put in from Shakespeare and the Bible. In the wrong hands, this tool could inflate one’s ego! Another interesting feature is that Grammarly offers to monitor whether your writing improves over time, judging whether you’ve learned from your previous mistakes. When it implored me to consider it “your automated grammar coach”, I heard my old English teacher guffaw from beyond the grave. To access Grammarly’s full service costs up to $29 per month. Alternatively you can download free of charge a cut-down version, “Grammarly Lite”. (It resists the urge to change Lite to Light.) You can also buy a one-off professional proofreading service for a manuscript, which is then farmed out to a real person, presumably a professional subcontracted to Grammarly. I cannot vouch for the quality of this service as as I didn’t test it. What is its value to indie authors? Grammarly is not pitched at professional or creative writers and authors such as ALLi members, but at students and employees who have to write reports and papers. Applied with caution, it could be a useful tool for under-confident writers seeking quality control before submitting work to their superiors. For indie authors, Grammarly might be useful when you have become so familiar with your copy that you’re virtually word-blind to it. I might consider running a manuscript through the system to eliminate silly, avoidable errors as a matter of courtesy before submitting it to my human proofreader. But I can’t imagine that any proofreading professionals are worrying about being made redundant by Grammarly. To be fair, Grammarly’s Nikolas Baron suggests that the software is “best used as a second set of eyes for writing” rather than to replace a professional proofreader. In fact, not only will it not replace a professional proofreader, it’s not even a decent substitute for an unprofessional proofreader. (You know, the sort that writing textbooks always caution you against using – your friend who’s an English major or your mum who reads a lot of books). Why is it so popular on Facebook? With my high hopes dashed, I searched the internet for other people’s reviews of Grammarly. Was I missing something? Finding some damning results in high places, such as this review by The Economist, I began to wonder why 739K people had liked Grammarly on Facebook. Surely they’re not all endorsing it as their proofreader of choice? Further examination of Grammarly’s Facebook page enlightened me. Its timeline consists largely of the sort of literary wisecrack and shareable photo that word-lovers adore – e.g. two plates of alphabet soup, one jumbled up, the other with the pasta letters arranged in alphabetical order. In fact, I discovered that in a moment of weakness, I’d even “liked” it myself. Smart marketing, Grammarly. I don’t think that gives them the right to use your material in other ways, but I am no lawyer and am still wondering. Cathy, I would recommend that instead of seeking software to do this for you (I don’t know of any that is 100% reliable), you consider reading up on the subject and acquiring some professional-level editing skills, which can be done via books, online courses, night school, etc. I’m not US based so can’t recommend anything specific for you. I suggest you visit your local bookstore and ask for recommendations of good books, or search online. There are also ALLi members who write books about grammar and editing e.g. C S Lakin and Jessica Bell, but these are more geared up for fiction writers rather than report writing. A search online will be helpful to you, I’m sure – try browsing the Amazon store with various search strings, and use the “look inside” feature to pinpoint the books that will be the most appropriate for your particular situation. Good luck wit your new role! Great, Informative Post, like this one must be maintained so I’ll put this one on my bookmark list of Professional Proofreading Services. Thanks for this wonderful post and hoping to post more of this. Have Great Day. And all this time I thought Grammarly was just a source of memes for smart people! lol I had no idea they offered proofreading services, since I’ve never actually checked out their website. I’m glad to know that it is a service that isn’t worth much. I will continue to enjoy their memes, but won’t be drawn in by their offer of services. Thanks! lot of interesting information in your blog. Glad I found this post, since I just got an email through my livejournal account, offering me a $50 Amazon gift card to let Grammarly sponsor one of my blog posts. Funny, since I don’t blog much, and even more rarely do I actually blog about writing advice (which was the type of post they wanted to sponsor). And I must admit that I was a bit creeped out by Nikolas Baron’s invitation to have coffee with him if I was ever in San Francisco, like we’re old friends rather than complete strangers. Brilliant article on proofreading. Proofreading improves the essays strength. I took a six month subscription to try it out. I’ve run most of my blog posts and chapters from my current novel through it. After awhile, it becomes pretty obvious that the program catches a narrow band of issues amid a lot of totally useless advice. What I have learned from the program is to be on the alert to the number of times I make the same types of errors and that has been valuable. As to replacing a real live editor – not on your life. I am also very dubious about a program I can’t buy outright and must pay a monthly fee for. And liking the Grammarly Facebook site is definitely about the funny poster posts and not about endorsing Grammarly. Just as an aside – I recently received an email from Grammarly offering me a $10.00 Amazon gift card if I would write a blog promoting the product. I don’t use my blog for such things but the offer sure caught me off guard. Not sure why. Still a bit wet behind the ears in terms of how social media works, I guess. Thanks for reviewing this product, Deb. Francis, you make a good point about being suspicious of a programme that you can’t actually buy outright! It does seem that the Grammarly team are bombarding everyone with emails. I had one from them initially that seemed like a nice personalised message at first glance, then I spotted the exact same message being left as an unsolicited comment on another writer’s blog. Quite bizarre! Still, I suppose it has got us all talking about Grammarly, which may be part of their intention! Thanks very much for adding to the discussion here, Fran! I’ve used Grammarly for several months now. I’d agree with your assessments. I use it exactly as you suggested, to get rid of obvious errors that I’ve overlooked prior to sending work on to my editor. I wish it had an “add it to the dictionary” feature so that certain information, such as unusual names could be learned. That’s good to hear, PJ – and I agree with your suggestion for an “add it to the dictionary” feature, which ought to be relatively easy for them to do. Thanks for sharing your experience.